Summer time is so fun and one of our favorite things to do is head to the beach! We live about an hour or so away from the ocean so don't make it there often enough! 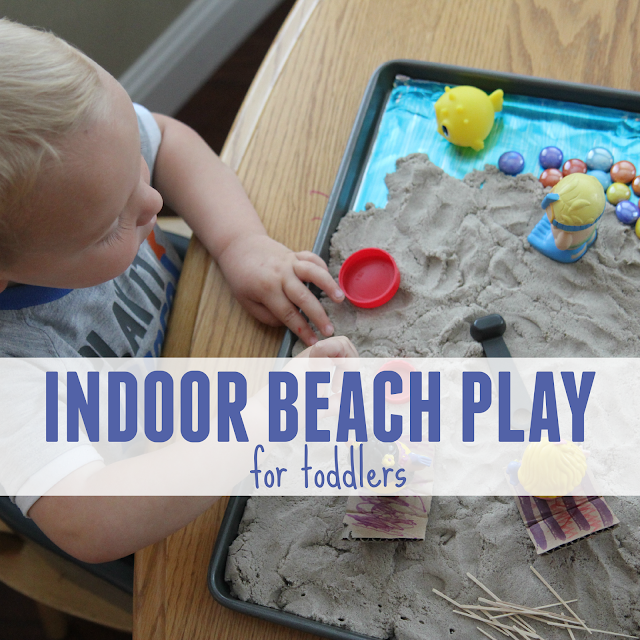 On hot hot summer days when we don't want to go outside or rainy summer days (like today) bringing the beach indoors is an awesome alternative! For Day 8 of our "A Very Toddler Summer" series we are doing an indoor beach activity for toddlers using kinetic sand and a lot of other fun sensory materials! 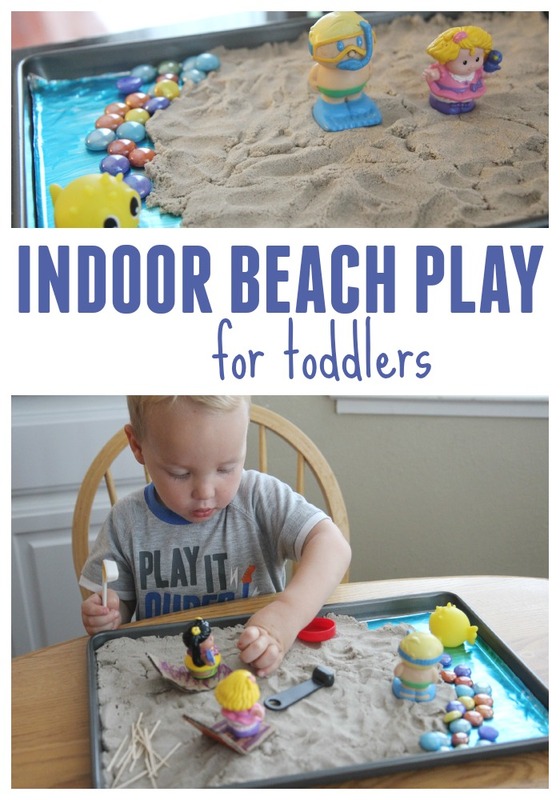 This activity was created for older toddlers that aren't eating things like sand, rocks, etc. If your child is still mouthing everything, try edible sand and larger sensory materials. I started by lining the baking pan with foil and then I colored a section of it with a blue sharpie to create the ocean. Next I added some kinetic sand and some pebbles and then the kids added their favorite little characters! We also made some beach chairs using pieces of cardboard and markers. Once everything was set up my toddler started playing! His favorite thing to do was fill up the lids with sand, using the little scoopers and then use the toothpicks to get the sand out. He also had fun building with the toothpicks in the sand to make a fence or other sort of structures. My preschool aged daughter joined in and added all sorts of animals and other items that she thought should go to the beach too! Small world play activities like this are so fun for developing imaginations! I do a lot of modeling of how to play with the materials and making the animals or people talk and play and then I usually just play quietly beside my son and then he just takes over the play and has so much fun! I love watching him use his imagination! This indoor beach activity was so fun and the use of the kinetic sand makes it so much tidier than using just regular sand... which I love as well!! Do you have any other favorite ways that you like to play with kinetic sand?? We love using LEGO with kinetic sand as well! 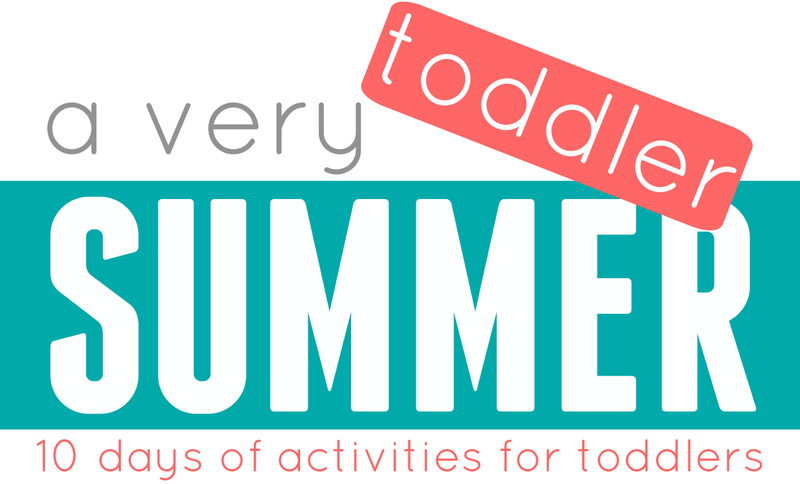 Don't forget to check out all of our "A Very Toddler Summer" series activities that have been shared so far HERE.